The success of Fun with Radio quickly led to the appearance of the other Fun with . . . titles, as listed below, covering every aspect of the radio hobby. The flow of new titles and revised editions embracing new topics and techniques continued until 1981. It is surely no coincidence that this flow ceased upon the death of Davey's Editor, Jack Cox, in that year. For the more advanced designs in these books, detailed practical wiring layouts are not always given. Davey saw them as having limited value given differences in the possible choice of components, and maintained that builders of advanced sets should derive wiring layouts from circuit diagrams and adopt good practice to avoid instability. This applies especially for the designs in Fun with Short Waves/Short Wave Radio, where small wiring differences between sets built to ostensibly the same design could lead to vastly different performance. The contents of these books are summarised here. Use the links below to get quickly down to the detailed chapter lists. A variety of valve and transistor short-wave designs for battery and mains (no transistor designs in the first edition). Chapters on short-wave practice and communications receivers. A little more theory offered than in most of the Fun with . . . series. Beginner's one-valver version. Chapters on amplifiers, loudspeakers, record players and tape recording. Chapter on the impact of electronics upon modern life. A variety of transistor designs including short-wave and superhet receivers, and transistor amplifiers. Chapters on the history of hi-fi, the Mullard amplifiers, record decks, tuners, amplifiers, loudspeakers, and ideas for self-build hi-fi. A book for the teenage-to-adult enthusiast with a slightly deeper pocket. Introduction to silicon technology, designs for medium-wave receivers and amplifiers, kits, loudspeakers. Fun with Short Waves / Short Wave Radio, 1st edition: Edmund Ward Ltd; 2nd & 3rd editions: Kaye & Ward Ltd.
1st edition Appearing only three years after the first edition of Fun with Radio, the much sought-after first edition (Fun with Short Waves), is vintage Davey - with every design valve-based, including several battery one-valvers. when he made amateur short-wave transmissions. resistor colour code; recommended books. General construction and usage hints given throughout chapter. DF91, DF92, DF96, 1T4, 1F1, 1F2; headphones. "lantern" battery, all built on slotted chassis as Chap. 2. 6J7 or 6K7 (Octal); headphones. EBC33 or 6Q7 (Octal), triode section; headphones. 2nd triode section as AF amp; headphones. of phones from anode to ground via blocking capacitor. Two designs using RF, detector and AF stages. DF91/92/96, DF91/92/96, 1.4v audio pentode; headphones. background noise (battery) versus low running costs (mains). Advantages of using good loudspeaker discussed. Southern Tech. Supplies "Power Pak" type B, choke 70mA. EF41, EL41 (or EL84); output transformer; speaker. 6J7, 6V6; output transformer; speaker. Other ways of receiving morse, including superhet and BFO. signals for applying to aerial terminal of broadcast set. welcome on advisability of using a setup like this. RF choke (all-wave); RF choke (SW); DF91. 2 x RF choke (SW), RF choke (all-wave); DF91, DF91. RF choke (SW); RF choke (all-wave); 6K8. RSGB "Simple Receiver for the Beginner" mentioned. Suggestions for introducing feedback as alternative to BFO. Eddystone BFO coil, 455kHz; 6J7. TV aerials as examples of half-wave dipoles. spaces; earthing methods; warning not to earth to gas pipe. Osmor Mini-magic - circuit shown. Cossor Model 701K - circuit shown. Non-isolated power supply. international Q code; abbreviations; Morse code. Cossor test gear; receivers by Eddystone and others. Addresses of suppliers (now obsolete). 2nd edition - note name change For the second edition, several chapters from the first edition were dropped, notably those on superhet converters and VHF/FM receivers. New or revised chapters introduced transistor designs. Chapter order was revised to enable the "Amateur Radio" chapter to follow on from the introductory chapter. Similar chapter titles or designs thus appear under different numbering than in the first edition. a short-wave transmitter in post-war Berlin. country prefixes; time zones; tools; recommended books. 1-valver using 6.3-volt valve, heater powered by "lantern"
6J7 or 6J7G (Octal), or EF80 or EF85 or EF89 (B9A); headphones. DL96 with separate LT supply; headphones. OC170, OC71, 2 x OA81; earpiece. Powered by mains unit, Chap. 7 (below). EF89, EL84; output transformer, speaker. Note regretting disappearance of silent-background 2-volt valves. Mullard 3-3 or Sinclair Z12 amps cited as alternatives. 5Z4; 2 x smoothing chokes 80mA. Optional additioal smoothing shown for Sinclair Z12 amp. transformer secondary and bridge circuit (4 rectifiers). EF86, EL84; output transformer, speaker. 6J7, 6V6; output transformer, speaker. Repanco driver transformer TT55, output transformer TT56, speaker. Repanco XSF38, XSF35, XTF32, and 3 coils * above; OC170. Mention of AR88, R1155 and new sets by Codar. HAC one-valver; Sinclair Micro FM. 3rd edition Like many of the later Kaye & Ward editions and titles, the third edition of Fun with Short Wave Radio appeared in a smaller format than the first two, with smaller print and, sadly, some diagrams and other details omitted. These omissions might not have been serious for the experienced constructor, but must have led to many queries from novices. Chapter order is almost identical to that for the second edition. exemplified in Jamborees of 1975 and 1978-9. Uses AR8 (2v) with 3v LT supply dropped to 2V. Mullard 3-3 or Stirling SS110 amps cited as alternatives. powering battery valves (LT from battery). BFO coil not specified; 6J7 or EF89. Mention of AR88, R1155, and Codar CR70A. Heathkit's schematic shown, with some component values. Fun with Electronics, 1st edition: Edmund Ward Ltd; 2nd edition: Kaye & Ward Ltd.
1st edition Valves predominate in this book, both in terms of projects (only one transistor design) and in the equipment recommended or mentioned. Alongside the electronic and valve theory offered in the introductory chapter, the book serves to raise awareness of what is available. answered with clear and detailed advice. Davey quotes Encyclopedia Britannica definition of electronics. Sets out stall: mix of Davey designs, kits and ready-built items. Basic atomic theory; the electron. grid bias, LT and HT batteries. compared with the usual .0001μF. Teletron D/R coil (A, MW, R); DF91 or DF96. results with VHF) trusts that difficulties will soon be resolved. Jason FMT 1 and FMT 3, Daystrom and Heathkit FM tuners. Short-wave spectrum and uses of short waves discussed. Reminder of need for a licence to operate a transmitter. advice not to use headphones with mains-operated sets. Mains transformer 250v primary, 250-0-250v 60mA, 6.3v 1A, 6.3v 2A. Optional bandspread, tone and volume controls. room acoustics and remembering to enjoy the music. Books by G A Briggs recommended. transistor amplifier mentioned as recently introduced. which includes 3-watt (3-3) and 10-watt (5-10) amplifiers. Baxandall design (Wireless World Diary). Fun with Records and Amplifiers title promised. and Philips Auto-Mignon 7" player for cars. Several record decks and pickups mentioned. captured German wire recorder), to modern uses including video. Mullard tape amplifier and pre-amp designs mentioned. oddities such as the Gramdeck. notched bridge for strings carried on brass/stalloy armature. Importance of the electronics industry for exports. Rise of reliable computers using transistors. 2nd edition Since publication of the first edition in 1962, two editions of Fun with Transistors had appeared, and Davey refers readers to these and to radio periodicals for transistor radio designs. 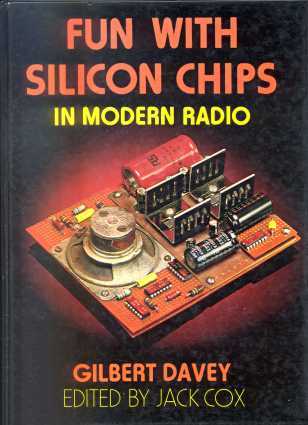 There is still only one "Davey design" in this book using transistors; all other projects are either valve-based or recommendations for ready-made equipment. The circuit symbol diagram now includes transistors. Advances of computers and integrated monolithic circuits. High-Fidelity - compact amplifiers and loudspeakers. Rise of VHF, stereo and local stations. especially coils; rise of modular kits. Britannica definition of electronics, brief atomic theory. Circuit and layout show Teletron D/R coil, but alternatives given as below. largely dropped, but DIY alignment difficulties remain. Pre-aligned modules, Martin Electronics Ltd.
Sinclair 5-watt integrated amplifier and pre-amplifier. Mullard Unilex module and control unit. Heathkit (Daystrom) kits and ready-made equipment. Same loudspeaker units as 1st edition still recommended. e.g. carpet felt, cellulose wadding or cotton wool. Circuits for Audio Amplifiers; stereo theory discussed. Mention of imminent launch of Philips video recorder. Fun with Transistors, 1st edition: Edmund Ward Ltd; 2nd edition: Kaye & Ward Ltd.
1st edition Davey's first transistor designs had appeared in Boy's Own Paper as long as seven years prior to Fun with Transistors first appearing. To some extent it thus served the same purpose as had the first edition of Fun with Radio, in gathering together and making available some of the transistor designs that had appeared in BOP. to date without a sound working knowledge of them. 1st edition, contains no transistor symbols. and comparison with function of triode valve. Mullard Reference Manual of Transistor Circuits. OA81, OC71 or OC72; earphone or personal earpiece. "Lady Jayne" hair grip idea mentioned for heat sink. Poor diagram of coil; point to point wiring instructions given. OC44, 2 x OA81, OC71; crystal earpiece. Notes on selectivity, aerial length, and use of aerial trimmer. using 2 x DRR2 coils and diode for feeding audio amplifier. constructor if allied with alignment service. (Practical Wireless design using Osmor coils). feedback resistor value and output transformer ratio. driver transformer, output transformer; speaker. sets from pocket size to table models. socket, telexcopic aerial for FM. listeners whose local programmes are on short-wave. Ready-made receivers - Sobell S314 (also MW and LW). e.g. Mullard OC170, OC171 (< 70MHz); AF114 (< 100MHz). Mini-Clipper, valve detector + optional 2-transistor amplifier. Also Clipper and Super Clipper. Usual warning concerning need for licence to transmit. tuning capacitor; adjust no of turns on coil; use short-wave RF choke. Audio transistor (not specified); output transformer, speaker; Morse key. Also mentioned: AC eliminator/battery charger by Eagle Products. Davey recommends this unit for sets with loudspeakers only. Mains transformer with secondary 6.3v 1A; 2 x OA81. outfit, radio cameras and spacecraft. Davey encourages readers to consider a career in electronics. 2nd edition Many of the BOP transistor designs were repeated, but a feature of this edition is a modular approach to building a transistor superhet receiver, including a choice of transistor audio amplifiers. Circuit symbols page still contains no transistor symbols. in use, availability, and types of transistors. and book recommendations as 1st edition. Davey introduces modular construction for receivers. Other kits, Home Radio and Electroniques Ltd.
Pre-aligned VHF receiver kit, Martin Electronics Ltd.
AF117; rotary switch, 3-pole 2-way. Importance of good soldering technique stressed. 2 x AF117; 2 x OA79 or OA81. Rex LT44 driver transformer, Rex LT700 output transformer; speaker. Repanco driver transformer TT55, output trans TT56; 3Ω speaker. Wharfedale Bronze RS/DD; Super 8 RS/DD. or books by G A Briggs. AC127 (npn), AC128, AC128, AC127 (npn). lack of selectivity, but no alignment problems. Superhet kits from Heathkit (Daystrom) or Henrys Radio Ltd. Typical superhet circuit shown (no values). speaker/cabinet, determines type of set from portable to hi-fi. amplifier from Chapters 8 or 9; speaker; cabinet. Fun with Short Wave Radio, Chap. 9. Fun with Hi-Fi, Kaye & Ward Ltd.
Fun with Hi-Fi Only one edition of this book was published. Its subject had partly been covered by the two editions of Fun with Electronics that preceded it, but in this book Davey gives essential theory and detailed advice for the enthusiast in search of the best sound his budget will buy. More of a buyer's guide, with no "Davey designs" as such. Brief account of early sound reproduction: Edison, Bell, Berliner. Summary of equipment forming a hi-fi reproduction chain. and 1930s that promised improvement. Amplifier circuits shown (including Williamson - no values). by launch of the Leak amplifiers. and amplifier details as below. Circuit (most values given), and layout diagrams. mains tranformer, secondaries 300-0-300v, 3.15-0-3.15v, 6.3v. mains transformer, secondaries 300-0-300v, 3.15-0-3.15v, 6.3v. mains transformer, secondaries 250-0-250v, 3.15-0-3.15v, 6.3v. thus how high he is aiming in terms of sound quality. and those of Editor Jack Cox. and balance of quality among system components. turntables, cartridges, loudspeakers and compacts. Requirements for good performance of turntable, pickup and cartridge. and 85S, and units by Leak and Lenco. Cartridges mentioned include units by Shure, Goldring and Acos. e.g. Heathkit AR2000 receiver - specifications given in full. and Goodmans. Importance of good FM aerial for best results. for valve amplifiers becoming difficult to obtain (1973). but personal preferences are the deciding factor. Consider foreign (especially Japanese) equipment too. directionality, and advantages of dual-unit assemblies. and advances in magnet design etc. illustrating importance of speaker positioning. Be content with "mid-fi" at first. FM tuners - pre-aligned kits again recommended. if components can be obtained, and provides good experience. booklet Transistor Audio and Radio Circuits, and periodicals. Dimensioned drawing given, with advice on orientation. Wooden H-frame; aluminium rod or copper pipe; 75Ω cable. Davey recalls that at school he was "not too bright at woodwork"
but has made many successful enclosures. Speaker kits by Heathkit \nd Goodmans also mentioned. Dimensioned drawing given, with options for providing vent holes. Rank Wharfedale Super 8 RS/DD or 8" Bronze RS/DD. 1/2" chipboard; surgical cotton-wool; 10" x 6" elliptical speaker. Recommended books by G A Briggs, Gordon J King and Percy Wilson. response, and exclusion of domestic distractions. Davey sceptical about quadraphonic sound - will humans develop four ears? Fun with Silicon Chips in Modern Radio, Kaye & Ward Ltd.
in Modern Radio Only one edition, in the smaller Kaye & Ward format. The use of monolithic devices with ancillary components offered scope for practical experiment with layout and construction methods. Davey seemed to relish this chance to present simple chassis-based radios almost as he had done formerly with designs based wholly on discrete components. Development of radio, the thermionic valve, crystals. silicon chip; development of integrated circuits. CSC breadboard, Veroboard, soldering irons. Solder and soldering technique, heat sinks. Reading circuit diagrams, theory books. Scarcity of manufactured coils; aerials and earths. First published in BOP, Dec 1963. Either coil from Chap. 3; high impedance phones. OC44 or AF127; OC71 or AC128; 2 x OA81; crystal earpiece. Quality limitations of AM radio; FM and stereo discussed. circuit diagrams and brief description. RF, IF and AF amplification briefly discussed. Amplifier stages using ZTX300, BC108 or OC71. Comparison with weight and size of Mullard 5-10. Veroboard; TCA949 with heat sink; speaker. Basic Veroboard layout given; 2 x TCA940 with heat sinks, speakers. suggested; TDA1010 with heat sink; speaker. Circuit only (no description); 2 x audio transistors (not specified). Note on using battery eliminators. TBA810S amp on Veroboard as Chap. 7; speaker. good results with salvaged units. Briggs design for 8" unit described. with internal shelf, rear vent, damping material. Safety - enclosure essential; isolate before adjusting. Mains transformer, 9-0-9v secondary; bridge rectifier 1-2A, 100piv. Applications in radio control, toys and computers. Schematics for TBA820M in audio amps. Sinclair ZX80 computer as kit or ready-assembled. for the experienced constructor to work up. CONTACT ME This long page is now substantially complete, but I hope to improve the cross-referencing in the course of time.